Now that we have demonstrated who the Host of Heaven are, we are going to look at how they operate on planet Earth. It is interesting to note that as we look at current events we have a tendency to focus only on the political players that we see, and the strife and war that rages across our world. The question we should ask is what is behind it all. This is something to think about because all of us have a stake in the peaceful survival of our planet. I believe that most people want a chance to live in peace, raise their families, and enjoy the beautiful world God created for us. I don’t personally know anyone who says that they love war, and death, and destruction. Or, that they relish the thought of people dying from plagues and famine, and war. Yet that is exactly what we see: war spreading around the world; various factions vying for positions of power though manipulation and deceit; religious strife as one group destroys another; powerful Banksters who fund one group so that they may cause death and chaos–and then the same Banksters who make money from both groups as the war machine rages on. Why does it have to be this way? Our world today is one of the most educated generations on planet earth–you would think that intelligent, educated people would want to promote peace and prosperity for all; but that is not the case, and it is, for the most part, the complete opposite of what we see. Have you ever ask yourself why, why is the world like this? Why is one nation destroying another; why are religious fanatics raging and brutalizing one another, and destroying innocents in the process; why are the leaders of industry and the Banksters funding crooked politicians so that they can influence policies to enslave their fellow-man with low wages, so that they, the bankers, the leaders of industry, and deceptive crooked politicians may personally prosper from that cheap, expendable labor–how do these people sleep at night? In the United States I am watching the destruction of our Constitution (by two totally corrupt political factions); yet our Constitution is one of the most important documents in world history–and applied properly it works to free the common man to grow and prosper, benefitting all. While we see politicians, kings, dictators, and others robbing the common man, corrupting the system, and creating chaos for their own political and economic gain, behind the scenes operate powerful spiritual forces raging in a seemingly never-ending war between good and evil. (Some of these politicians, kings, and dictators know who they are actually serving, others only shudder if they think about it at all). Yet, what is the endgame? Where is it all going? I hope you will agree with me that it is only through the wisdom of the biblical prophets that we can make any sense out of it all; and I believe that once we look through the lens of the Bible, historical as well as contemporary events will begin to make sense. THE PROPHET DANIEL WONDERED ABOUT ALL OF THIS TOO! As many of you know, Daniel was caught up in the events of his day. In his earlier years he was taken captive by the military forces of the Babylonian King, Nebuchadnezzar when they invaded Israel. Later, Daniel proved to the King his worth as an interpreter of dreams and events, and as a man of God who served wisely in the foreign court of Babylon. Yet Daniel was concerned with the future of his homeland, and for the people of the nation of Israel. Because of this he began to fast and pray, repenting for the sins of the nation and seeking wisdom and understanding from the God of Heaven. In those days I Daniel was mourning three full weeks. I ate no pleasant bread, neither came flesh nor wine in my mouth, neither did I anoint myself at all, till three whole weeks were fulfilled (Daniel 10:2-3). During this time Daniel didn’t know that behind the scenes a spiritual battle was raging. 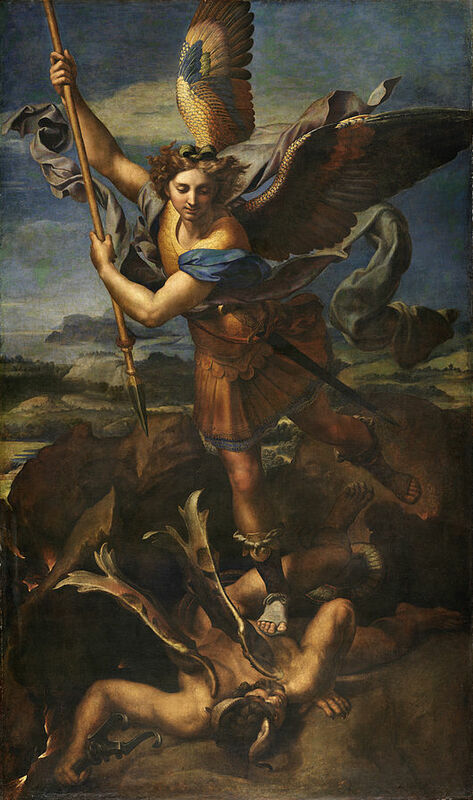 When an angel does appear he informs Daniel that he was engaged in this battle by other powerful spiritual beings who stood in his way, holding him back from appearing to Daniel for twenty-one days. According to the language of the verse, the Prince of the Kingdom of Persia withstood him, or, “stood over against me. The fair meaning is, that he resisted or opposed him; that he stood over against him, and delayed him on his way to Daniel” (Barnes Commentary). I am of the opinion that this portion of Scripture provides us with a small glimpse of the war that is occurring in the spiritual dimension. Perhaps the Prince of the Kingdom of Persia rules that nation from the spiritual dimension acting as an influence to the human kings of Persia–who are under the influence of Satan. It is reasonable to conclude that the Prince is a fallen entity because he opposed the angel who was engaged to appear to Daniel. The Prince of the Kingdom of Persia did not want Daniel to receive the angel’s message, a message that originated with God. The Apostle Paul describes the four tier hierarchy of fallen angelic entities that rule the world through sinful, corrupt, economic and political leaders, as well as religious leaders given over to the spirit of the age. Most of you are already very familiar with Ephesians 6:12. It reveals the spiritual powers who administer the zeitgeist or spirit of the age. The principalities are the Archons that run the entire show, Satan being chief among them. The powers refers to exousia or spiritual authorities and are entities who rule under the Archons. The rulers of the darkness of this world refer to beings called Kosmokrators. These beings operate under the authority of the Archons and the exousia or Authorities. It should be noted that the Prince of the Kingdom of Persia is probably a Kosmokrator; because these beings rule the world directly through flesh and blood human beings. They rule over the spiritual darkness of the current world system. The last beings that Paul writes of here are entities that he called spiritual wickedness in high places. They are the poneria epouranios or the wicked spirits of the heavens, or the lower regions of the atmosphere of the earth. They are responsible for pushing evil desires and purposes among the sons of Adam. It should be noted that these beings are depraved and commit deeply wicked acts against human beings with extreme malice. These four types of spiritual beings, fallen angels, are the moving force of wickedness among the nations of the Earth. Couple their actions with the sinful and depraved actions of human beings and now you can see why there is so much evil in the world. All of the evil things we see in the news and in everyday life are empowered by these fallen entities. Were it not for the grace of God we would be completely run over by these entities. Thank God for salvation through Jesus Christ, without that there would truly be no hope. But there is HOPE. One day God will judge the world. He will judge these four types of fallen entities, and He will also judge sinful humanity. And it shall come to pass in that day, that the LORD shall punish the host of the high ones that are on high, and the kings of the earth upon the earth (Isaiah 24:21). All of the wicked acts that are committed will stop, and Christ will rule and reign over the kings of the Earth–and in a New Heaven and a New Earth God will finally dwell with humanity. It will be peace and blessing forever and ever. And I heard a great voice out of heaven saying, Behold, the tabernacle of God is with men, and he will dwell with them, and they shall be his people, and God himself shall be with them, and be their God. And God shall wipe away all tears from their eyes; and there shall be no more death, neither sorrow, nor crying, neither shall there be any more pain: for the former things are passed away.(Rev. 21:3-4). You can make it to the New Earth only through Jesus Christ. He provides the way of salvation. Eternal life is found only through Him by faith; and faith is simply trusting in the promises of God. The gospel of Christ is so simple–Christ died for our sins according to the Scriptures, and He was buried, and three days later he arose from the dead. If you place your faith in Christ, He will forgive your sin and grant you eternal life. Receive Him today, and through Jesus you will win the spiritual war! That if thou shalt confess with thy mouth the Lord Jesus, and shalt believe in thine heart that God hath raised him from the dead, thou shalt be saved. For with the heart man believeth unto righteousness; and with the mouth confession is made unto salvation. For whosoever shall call upon the name of the Lord shall be saved (Romans 10:9-10,13). If you would like to learn more about the spiritual war that is raging all around us then I suggest you might consider getting a copy of my book, Alien Antichrist, The Terrifying Truth about UFOs and Aliens, Antichrist, and the End of Days. I go into great detail in the book about the last days deception, the strong delusion Paul wrote about, and how all of it ties in with the doctrines of devils and spiritual deception linked with the ascendancy of the Antichrist figure of the last days. This book is an in depth look at the ancient alien question and the Bible and how the two relate. The book is extemely well documented to back up all of the reseach in this book. With all the shows on TV, regarding UFO’s, this book gives a comparision to what was written centuries ago in Bible. If you have any interest in either of the two subjects this book is a must read. As a serious researcher into UFOs – it’s any wonder why we are no nearer in solving this mystery which higher establishments are at pains to hide. The author has some really interesting theories. A brilliant and well written book – it’s 5 stars from me. Our past has a lot to say about our future. 1. Raphael [Public domain], via Wikimedia Commons http:// commons. wikimedia.org/wiki/File%3ALe_Grand_Saint_Michel%2C_by_ Raffaello_ Sanzio%2C_from_C2RMF_retouched.jpg. 2. For more information about imported Nazi scientists and others see the article at: http://en.wikipedia.org/wiki/Operation_ Paperclip# Key_ figures. 3. Letter to Bishop Mandell Creighton, April 5, 1887 published in Historical Essays and Studies, edited by J. N. Figgis and R. V. Laurence (London: Macmillan, 1907).